Vikings coach Leslie Frazier did not announce a starting quarterback during his press conference Monday, but he eliminated one of the three quarterbacks from the running. Frazier said the decision has come down to either Josh Freeman or Christian Ponder, which leaves Matt Cassel out of the mix, Chris Miller of the Minneapolis Star Tribune reports. The Vikings play at Dallas on Sunday. Frazier will make the decision over the next few days as he evaluates the situation with his staff. Freeman dealt with concussion-like symptoms last week, but was cleared on Friday. Frazier said the staff will be conscious of the injury and it could still play into the decision. Frazier will also look at Ponder’s performance against the Packers on Sunday night at the Metrodome, and said he felt Ponder looked more relaxed Sunday than he did in his previous three starts. Ponder went 14-for-21 for 145 passing yards and rushed for 38 yards with a late touchdown in the final minutes of a 44-31 loss. Either one carries a good chance of bringing home the L.
The worst thing these Vikings could go out and do is win a handful of their remaining games this year. It is time to openly acknowledge that Ponder is not the future and the team will clearly no longer commit to him as a possibility for that, but Freeman is not the future either. I don’t care how well he starts to play. Unless he starts banging down Peyton Manning numbers circa 2013 (which just isn’t going to happen), his best contribution to the Vikings will be to help lose games so as to snag a high draft-pick that could and hopefully will lead to the real next franchise QB for the Vikings. We all know that the latter is the far more likely case. The rest of this season’s schedule has continued embarrassment written all over it. At this point, I say that’s a good thing. The coaching staff needs to be wiped nearly entirely clear. Frazier, Musgrave, maybe even Williams. Spielman should be on the hook for garbage like acquiring Freeman and certain fizzle-out draft picks (there have been a few stinkers). He’s on my good side for the way he’s handled the majority of drafting, though, and a lot of the blame of many of the draft-duds can be blamed on inept player grooming and development, which is a coaching issue. Add to that poor game management, inexcusably awful schemes in execution on game-day, misuse of talent, and an implosion of team mentality and there’s nowhere to point at for the major overhaul other than coaching staff. Mr. Wilf, please take care of business. @Fisher…BROTHER, YOU SAID A MOUTHFUL! Your post is absolutely sensational in context, as well as content. Words more true have NEVER been written OR spoken…EVER! I sure wish that I’d beaten you to the punch and written the exact same thing. Although I’ve been shouting similar sentiments from the hilltops since the season started, (including, having seen a lot of film on him, SCREAMING to at least give Mcleod Bethel-Thompson his shot…I really think he could’ve wound up being the starter), and then, of course, true to form, THEY CUT HIM to make room for Freeman. My question is…how can at least a couple dozen other NFL teams have starters that can, more often than not, end a game with a passer rating that’s over 70 or 80, and the Vikings go 20 YEARS before they can just TRY TO DO IT?? 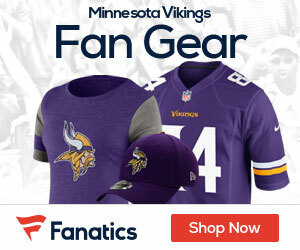 Most everything I had been saying concerning the teams’ AND the coaches’ ineptitude, (all over nearly every Viking site there is), had been getting pooed off and was gathering nothing more than snide remarks from other Viking fans, claiming that I was NOT a true Viking fan, given what I was posting. BUT, AS THEY ALL CAN SEE NOW, most everything I stated was, and is true. Many kudos to you, Fisher, for stating nothing but truth and the facts as they REALLY ARE. VERY, VERY eloquently said! SKOL BROTHER, and even though it may seem to many that I shouldn’t be allowed to say it…SKOL VIKINGS!! Whoops! I had nearly forgotten one more comment I wish to share with you, and any other TRUE VIKING FAN that happens to read this. IF, IF they wind up with a high enough draft pick next year to select ANOTHER QB, I HOPE TO GOD ALMIGHTY that they GET IT RIGHT THIS TIME, and don’t waste another high first round pick on a Ryan Leaf…or a Todd Marinovich…or a Christian Ponder.